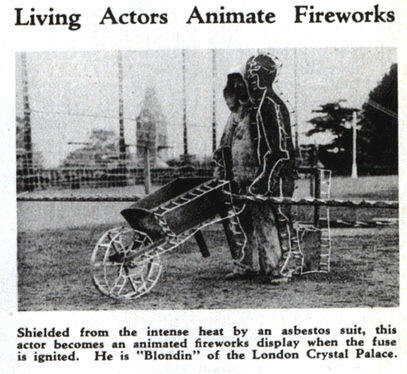 pyrotechnics animated by living per-formers clad in asbestos suits have been part of the display which thrilled London audiences at the Crystal Palace during the past season. Most famous of the acts is "Blondin on his tight rope," in which "Blondin," outlined in blazing powder, pushes a fiery wheelbarrow across a flaming plank. The heat generated by the display would be sufficient to melt iron.